If you are one of the thirty million U.S. citizens waiting for summer to start so that you can pack your bags and tents and head into the wilderness, chances are you are a dog owner. This is a common association to make, adventurous people and canines. But all too often dog owners choose to leave their pooches behind. Excuses such as “They won’t let him into the campsite” are lame and disconnected. Surely there’s a campsite near you that allows pets. The more radical dog owners have even made shopping malls open to their furry companions. Your pet needs exercise, just like every other dog, and you want him to stay healthy and playful, so consider camping with your dog his time. When camping with your dog you will have to bring more dog food than you would usually provide at home. Your pet will be out in the open and spending a lot of time running around. Temperatures are going to rise, so an extra supply of water will also be necessary. Naturally, you will need a leash, food and water bowl, and an extra blanket for him. If he has a dog bed, bring that too. He might get dirty out in the wild, so pack a brush and dog shampoo in case you need to bathe him during your trip. The flea and tick season is upon us, and you never know just how much trouble your pet can get into by running through the tall grass and rolling around carelessly in the dirt. You certainly don’t want a flea or tick infestation in your home when you return, so bring along more immediate flea treatments for pets in case he starts itching. Lastly, don’t forget a big bag of your dog’s favorite treats to get his attention if he is difficult to manage. He probably isn’t used to traveling and distractions in the wild are abundant, so flashing a biscuit, bone or chewy just might be the immediate solution to your discipline issue. Why go through with all that trouble? If you need more reasons to go camping with your dog, remember that canines need exercise. Your dog’s overall health depends on it, his digestive system depends on it, and walks and runs will certainly help your bonding, too. Dogs find ways to get exercise, one way or another, so it is up to you to provide and control the activities or let him dig through your garden and destroy everything he finds. 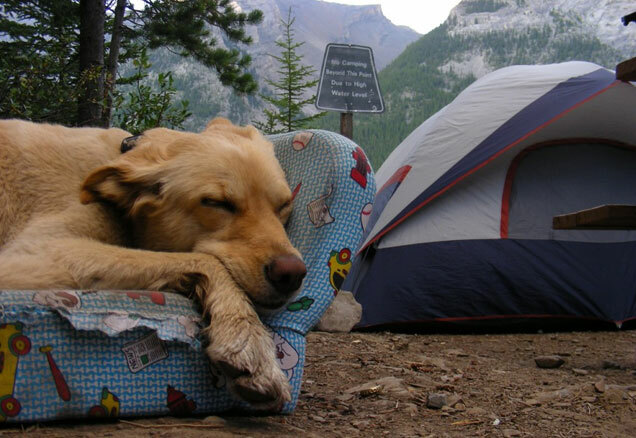 Camping with your dog should be an enjoyable experience for both you and your pet. If you are planning on staying indoors, choose a destination that is pet-friendly. You might be surprised just how many lodges now accept pets. If not, your ardent protector will certainly keep you safe at night while sleeping in front of your tent at your camping site. Take a deep breath, review the checklist, and don’t forget to allow extra space in your vehicle for your furry passenger. But most importantly, don’t forget your dog! Kate Flannery is a HighStyleLife blogger and an English Linguistics and Literature major. She started out in Perth, but has relocated to make her dreams of sailing around the Mediterranean Sea come true. Kate's journalist idols include Mallory Ortberg and Laura Brown, and visually she is inspired by pre-Raphaelites. She is working towards running a personal style/culture blog.